In our previous episode, Chuck Banner’s investigation into the murder of Technician Morricaine uncovers more pieces to the puzzle — but will F.R.E.D.D.’s analysis of crucial evidence reveal the killer before Banner and Mboa are executed for the crime? One of the keys to being a good space repairman, Chuck Banner liked to tell new recruits, is the ability to sleep anywhere. You never knew where an assignment might take you — the factory colonies of Cassorius IX, with their skyscraper-sized fabricators that cranked and groaned day and night, or the sprawling wind harvesters on Chang’s World, where even three-meter-thick force-walls could not fully muffle the screaming winds outside. Good space repairmen always needed their wits about them when they were on the job, and more than anything that meant a being able to grab a decent rest on demand. And no one could sleep like Chuck Banner. Legend had it that he had once slept through a hurricane on New Jupiter that had nearly brought down the cloud station on which he was working. This night, however, Banner found himself staring at the craggy ceiling of his prison cell, replaying in his mind all the evidence he had collected so far and trying to find the missing piece that would spare the life of the woman in the cell next to his, Banner’s old friend and fellow space repairman Patrice Mboa. And, not incidentally, his own life as well. There was no arguing the evidence in the video document from the scene of the crime; it clearly showed that Mboa was the likely murderer. But Mboa had no memory of the event, and had no obvious motive; indeed, she had never met Morricaine. So why had she done it? Mboa’s odd behavior on the video document taken at the asteroid deflector gave every indication that she had been subjected to a Desensitizer ray. And Jessick had reacted evasively to Banner’s question about the Desensitizer that Jessick had removed from Mine 34 that day. Constable Hallard’s case against Mboa for premeditated murder depended entirely on Jessick’s claim that a woman had called Morricaine asking him to come to the mine where he had been killed. And it was Jessick who claimed that he had repaired and returned the Desensitizer to Mine 34. And on Gallenesh, a person’s word was as good as proof. It was a problem that could achieve what a even Force 100 hurricane could not — deprive Chuck Banner of a good night’s sleep. The sound of hardened soles striking the stone floor of the corridor outside his cell snapped Banner out of his thoughts, and he swung his legs over the edge of the bunk and sat up in anticipation. A moment later, Hallard’s bearded face appeared in the window of the cell door, and after some rattling of the lock, the door swung open. “Mister Banner, your robot is calling your communicator and asking to speak with you.” Hallard held out Banner’s wrist radio. The moment of truth had arrived. Immediately, Mboa, in the adjacent cell, was on her feet and at the bars that separated their two cells. Nervously, Banner stood and took the proffered silver band. “Let’s have it, buddy.” Banner looked at Mboa, who peered nervously through the bars at the watch, as if she might be able to see the answer before hearing it. Hallard, too, appeared deeply interested. Mboa groaned, slumping dejectedly. But Banner’s head snapped up in response to something F.R.E.D.D. had just said. Mboa and Hallard looked at Banner with similar expressions of puzzlement. “Thanks, F.R.E.D.D. !” called Mboa, her voice filled with glee and energy. Banner and Mboa looked at Hallard expectantly. “Let’s pay Jessick a visit,” Hallard said forcefully. “Want to come with us?” he asked Mboa. “You had better believe it,” she said. Jessick emerged from the back room of Morricaine’s shop carrying a box and was surprised to see Hallard . . . with Banner and Mboa standing on either side of him. He tried to mask his surprise, but failed. “Hallard!” he exclaimed, trying to make it sound like a welcome surprise instead of the unpleasant one that it was. “And Mister Banner and Miss Mboa?” he added, puzzled. “I need something for my files,” said Hallard. “To close the case against these two off-worlders.” He gestured causally to Mboa and Banner, putting sarcastic emphasis on that last word. Jessick put the box down on the counter. “Whatever you need,” he said. “S-sure,” replied Jessick, unsure whether or not to be relieved. He took the sheet of paper and pen that Hallard held out for him, glanced over it, and signed it. Banner, Mboa, and Hallard all looked at each other. “I see that you’re right-handed, Mister Jessick,” said Banner. “I’m left-handed,” said Mboa levelly. Jessick’s eyes widened slowly, unable to hide his realization of his single, crucial mistake. “Jessick, I’m arresting you for the murder of Morricaine,” said Hallard. His last-ditch ploy having failed, Jessick sagged into a chair next to the counter that had been shielding him. Broken, he stared into space for a few moments. “He found out who I was,” he finally said, his voice a shaky whisper, all bravado gone. “I came here to escape,” he continued. “I changed my name. I thought no one would look for me here. But Morricaine stumbled on it somehow. I never did find out how,” he said with a rueful chuckle. “Oh, he tried not to let on, of course,” Jessick continued, as if relieved that he could at last tell someone. “But one day he started acting strangely around me. So one night, after he went home, I took a look in his files and found his diary recorder. I played back the entry from the day he first started acting strangely. He said he had found out my real identity. He was going to to tell you,” he said, looking up at Hallard. “But he was torn. He had trusted me and had vouched for me. He didn’t know what he was going to do.” Jessick paused, remembering. At the Gallenesh spaceport, the ground crews had finished fueling and provisioning the Ranger and Mboa’s ship, the Motsamai, and the constables who had been standing guard over them were nowhere to be seen. Hallard escorted Mboa and Banner to the base of the landing ramps, where F.R.E.D.D. was waiting for them. “That I will, my new friend,” Hallard said, putting his hand on Banner’s shoulder. After Hallard took leave of the two travelers, Mboa turned suddenly to Banner and gave him a bear hug that nearly lifted him off his feet. She growled at him like a happy mother bear. “Thank you for putting your life on the line for me!” she said. “Hey, what are friends for, right?” gasped Banner through the hug. “Anytime,” said Banner. “Safe travels!” Mboa waved as the channel closed. “Well, that was quite an adventure, wasn’t it?” asked Banner. F.R.E.D.D.’s chest-mounted tape banks spun in agreement. 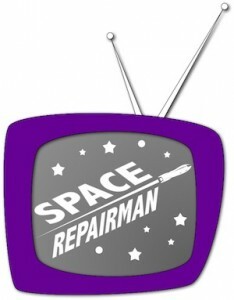 Stay tuned to Channel 37 for Chuck Banner’s next exciting adventure on Space Repairman! This entry was posted in Space Repairman, Word of Honor. Bookmark the permalink.